DeSilva+Phillips client Matterhorn Transactions, Inc. has entered into an agreement with LexisNexis® Legal & Professional, a leading provider of content and technology solutions, to offer its web-based transaction analysis tool, Matterhorn, to legal professionals. Matterhorn provides unparalleled capabilities to search for and compare the market terms of mergers and acquisitions as well as other types of transactions. Designed to assist legal and financial professionals negotiating and structuring deals, the tool will be called Lexis® Market Tracker and will be introduced in spring of 2013 as a component of Lexis® Practice Advisor. Lexis Market Tracker will leverage Matterhorn’s proprietary software, extensive database of agreements and unique data enhancement capabilities to provide legal professionals with the ability to quickly and easily search, find and compare similar deals, so they can confidently draft documents based on the latest deal information. 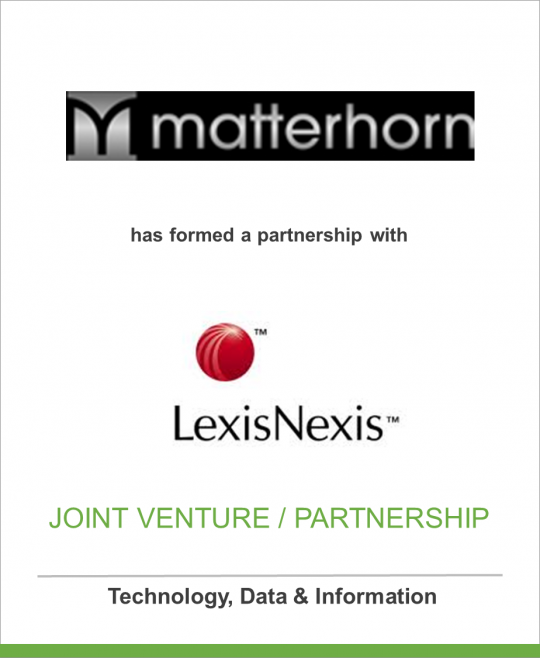 As part of the agreement, LexisNexis becomes the exclusive reseller of the Matterhorn tool in the legal market. The Lexis Practice Advisor offering currently includes ‘Business Law,’ launched in January 2012, ‘Financial Restructuring & Bankruptcy,’ launched in May 2012, and ‘California,’ launched in August 2012. A Corporate Counsel module will be introduced in November 2012, followed by ‘Securities & Capital Markets’ and ‘Mergers & Acquisitions’ in spring of 2013. More information about the Lexis Practice Advisor offering is available at http://www.lexisnexis.com/en-us/products/lexis-practice-advisor.page. Matterhorn Transactions, Inc. is an entrepreneurial company that brings transparency to complex negotiated transaction documents. Matterhorn’s proprietary data analysis allows practitioners to quickly source objective, reliable data to support their positions in high stakes negotiations. Matterhorn’s mergers and acquisitions analytics toolkit was designed with input from M&A practitioners from top-tier investment banks and law firms. LexisNexis® Legal & Professional is a leading global provider of content and technology solutions that enable professionals in legal, corporate, tax, government, academic and non-profit organizations to make informed decisions and achieve better business outcomes. As a digital pioneer, the company was the first to bring legal and business information online with its Lexis® and Nexis® services. Today, LexisNexis Legal & Professional harnesses leading-edge technology and world-class content, to help professionals work in faster, easier and more effective ways. Through close collaboration with its customers, the company ensures organizations can leverage its solutions to reduce risk, improve productivity, increase profitability and grow their business. Part of Reed Elsevier, LexisNexis Legal & Professional serves customers in more than 100 countries with 10,000 employees worldwide.